This work is dedicated to my beloved wife Phoebe and my son Ray for their patience and understanding during the period of my study at Kampala international university. I would like to thank my supervisor Prof. Sunday Olwor N. for being there for me whenever I needed him and also offering his professional advice where necessary. I would like also to thank my friends for supporting me in regards to my research. Am also grateful to my parents, Mr. Jared Abeka and Mrs. Martha Jared, my brothers and sisters, especially Perez for her generous financial and moral support that made me to finish this project successfully and my colleagues staff members of Kampala International University for mounting all the directives, procedures and methods of carrying out this research project. I would also like to thank the respondents who returned the questionnaires and those who were cooperative to me. To all those whom i have not mentioned, as well as others whom i have no space to name. I am most sincerely grateful. It is increasingly more interesting to the bank managers to understand what is important to customers when it comes to Internet banking, and especially banking conducted by the customers themselves. Corporate customers and Internet banking has been studied very modestly in the past, and especially the decision-making factors driving customers to go online. The purpose of this research is to identify the factors that influence corporate customers adoption of Internet banking services in Kenya, Uganda, Tanzania and Rwanda. The hypotheses are empirically evaluated by using Trade Finance customers of an East African bank as the target sample. Technology Acceptance Model (TAM) is the primary basis for the study. The information gathered from former studies that are mainly concentrating on private customer acts as a foundation for building an extension of TAM suitable for corporate customers. The study involved 137 respondents from Kenya, Uganda, Tanzania and Rwanda. Due to the quantitative nature of the study, the results are analysed with statistical measures. This included the use of SPSS to carry out regression analysis. The analysis reveals that corporate users are not motivated by the same factors as private users. In order to become Internet banking customers, it is extremely important for corporate users to have a system that is easy to use and operate with full support from the bank. Introduction to the book explains the background and objectives of the study. Also description of the delimitations and structure are included in the first chapter. According to Internet World Stats (2000), 5.3 % of the total world population (6,767,805,208) was using the Internet. This means that approximately 360,985,492 people all over the world were connected to each other. Today the situation is very different from that of a couple of years ago. In nine years the amount of Internet users has been increasing by 362.3% (www.internetworldstats.com). These massive figures very well reflect the scope and size of this the network. There is no other channel in the whole world bringing people so close to people, people so close to business or business so close to business than the Internet. technology (IT) has an increasingly important role in modern banking of any kind, especially when directly accessible by the bank’s customers. Not only has the Internet demanded customers to change their habits and even to learn new skills, it has also become a major challenge to banks themselves. The amount and scale of products and services offered online has grown continuously, basically providing something to everyone. Internet has also changed the nature of competition among companies providing banking and investment services. Those having more traditional look on the business are forced to change their view towards the markets. This means taking more proactive approach to providing Internet and mobile services. Historically branches and physical distribution channels have been the very cornerstones to most banks’ market success. However, the emerging electronic channels have forced banks to change their entire management approach. Much of this is thanks to the fact that geographical and time restrictions do not limit the use of banking services anymore (Karjaluoto et al. 2002). As long as customers are connected to the Internet, they should be able to use the services when and where ever. The whole banking strategy has changed as a result of this; people are not dependent on the bank having branch closest to them physically, as it used to be. They can choose whichever bank offering its services online - or even several banks to serve different banking needs. This kind of development has shifted banks’ attention more from marketing and selling of services and products towards building and managing customer relations. According to the research done by Devlin et al. (2003), nearly every bank will have online services available by the year 2011. Surprisingly, they found out that small banks have benefited from the emergence of the Internet: Online services help small banks also to strengthen their competitive position. Internet is contributing to making the competition even fiercer in the future, regardless of the size of the organization (Lüneborg and Nielsen 2003). Internet banking has also played a major role in changing the structure and amount of investments made to develop banking systems. Front-end and back-office systems are now designed to support the online service offerings. Online systems and development of the necessary infrastructure and system architecture receive majority of attention and information technology investments today. Providing real time data, and having the customers to key in the data instead of more experienced bank officers, requires also more from the system design. Although, the investments that have been done also seem to pay off, Lüneborg et al. (2003) discovered that banks providing online services experience a significant positive impact on different performance measures: sales, market share, and amount of new established customer relationships. These are all expected to be profitable at some stage of the lifecycle. In addition to tangible and measurable benefits brought by online banking, the more intangible ones are no less important, namely competitive advantage, customer retention and attraction. And very promising also for the banks is also that all of the above mentioned benefits eventually result in both increased revenues and reduced costs (Simpson, 2002). On average Internet bank customers are more profitable, maintain larger balances, use more bank products, and are faster in adopting new products and services, especially when compared to customers using more traditional channels (Hitt and Frei, 2002). This may, however, have much to do with the demographics and the background of this type of customers. Image and reputation of the bank should not be forgotten either: Internet bank offerings have a big influence on the image of the bank, as to the loyalty and satisfaction of the customer (Flavián et al. 2004, Shankar et al. 2002). It is fairly obvious that bank managers are interested in what can be done to increase the usage of Internet banking services. Understanding customers is important in any service industry. Identifying the elements that influence customers’ propensity to start using Internet banking is crucial in the process of acquiring new customers to go online, also it helps with understanding how the customers can be retained. East African banks are not any different in this respect. Nor is the small, traditional area of corporate banking used in this research, called Trade Finance, from other banking areas. Several studies have been conducted to investigate the issue from private retail customers’ point of view in several countries, from several aspects (Sudarraj and Wu 2005, Lassar et al. 2005, Lu et al. 2005, Shih and Fang 2004, Eriksson and Kerem 2004, Akinci et al. 2004, Pikkarainen et al. 2004, Sohail and Shanmugham 2004, Devlin and Yeung 2004, Gerrard and Cunningham 2003, Chau and Lai 2003, Liao and Cheung 2002, Karjaluoto et al. 2002, Suh and Han 2002, Liao et al. 1999, Sathye 1999). However, what are missing in this stream of research, are those studies looking at the issue from corporate customer’s perspective. The only one found was a qualitative study concentrating on the barriers to Internet banking adoption in Taiwan (Rotchanakitumnuai and Speece, 2002). 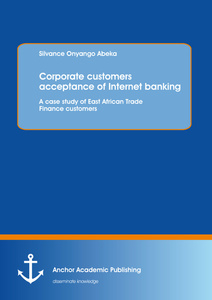 Trade Finance is a part of corporate banking, and this research aims to find out the factors behind the decisions of corporate customers to start using the Internet services provided by banks In the following sections The researcher discusses the use of Internet and Internet banking in East Africa. In addition he introduces Trade Finance business and products in general level, after which follows an examination of the business area and its role in Internet banking. Trade Finance as a phrase is somewhat misleading. To those unfamiliar with this business area, it might sound to be more describing to talk about international trade. Trade Finance involves parties, usually in different countries, importing and exporting goods by using documents as the payment instrument, or using international guarantees to secure that the beneficiary party gets the payment as agreed. When trading partners make a trade agreement, they also have to agree on the payment method used. Trade Finance products are suitable for most of the occasions. These products involve documentary payments, Documentary Credits (D/C) and Collections, and International Bank Guarantees. International Chamber of Commerce (ICC) establishes all rules for Collections, D/Cs and International Bank Guarantees. Those rules are made to be followed by all the parties involved to ensure smooth and reliable trade between all the countries. Trade Finance online services can work either two ways, or one way (stand-alone) depending on if the service is connected to the banks systems. Some banks provide online services for all the products, some only documentary payments or different combinations of Trade Finance services. When talking about online Trade Finance services, two way online services mean that the communication is done interactively: providing the customer a way of taking care of their Trade Finance business electronically via the Internet, sending and receiving transactions to and from the bank. Customers can make applications electronically, meaning they can issue deals (Import D/C’s, Export Collections and Outgoing Bank Guarantees) to the bank, and receive issuances of deals (Export D/C’s, Import Collections and Incoming Bank Guarantees) electronically from the bank. In addition to that, they can make amendments to the deals registered in the system, receive notifications and correspondence with the bank electronically, accept documents and payments and follow the status of their deals. Stand-alone service refers to a service that is not connected to the banks systems in any way. It merely offers the customer an electronic way of filling in applications and saving historical data on the deals. Online services usually provide the customer also a way of collecting historical data, making reports of them and using the deal information in various ways. For example the data saved is used to support accounting and bookkeeping for controlling and following up the company cash flow, liabilities and transactions. The aim of this study is to distinguish the factors influencing corporate customers’ when they make a decision to start using Internet banking services or not. The empirical evaluation is based on Trade Finance customers and their view on a specific Internet banking service provided. Corporate customers have several factors that influence them to adopt internet banking when transacting their financial business. Banks need to understand which factors may influence and attract customers to use internet banking, so that they can build long relationships with existing customers. Trust has been seen as a key factor in successful relationship marketing (Morgan and Hunt, 1994). Building a long relationship with customers can be the most important requirement for international and local banks so that they can keep their position in the market and compete globally. Banks should understand how they can attract customers from different countries, cultures, and backgrounds to use their services both online and offline. Factors that influence corporate customers’ decision to adopt internet banking should be instigated. In order to understand how banks can maintain good or successful relationship with customers and attract them to use internet services, Commitment-Trust Theory (Morgan and Hunt, 1994) and the Technology Acceptance Model (Davis et al., 1989) can be used as a basic for this study. The purpose of this quantitative study was to identify the factors that influence East African corporate customers’ adoption of online banking services. There are two levels of objectives the researcher considered such as main and specific objectives. The major objective of this quantitative study was to identify the factors that influence East African corporate customers’ adoption of online banking services. The first step was to investigate the background of previous research done on the area, especially Technology Acceptance Model, as it was used as the basis for the theoretical framework of this study. The conclusion of the theory was done based on discussions with Trade Finance specialists of the Kenya Commercial bank (referred to as the case bank in the remainder of the study). The theoretical model and hypotheses constructed to test it, was an extension to the Technology Acceptance Model. i. 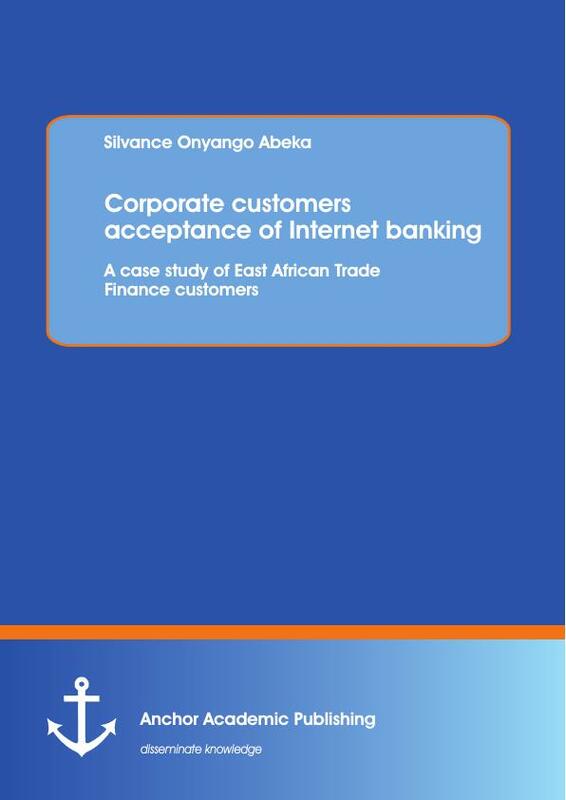 To find out how technology factors can mediate the effects of trust on corporate customers’ intentions to use internet banking by East African Trade Finance. ii. To find out if perceived ease of use of internet affect customers' decisions at East African Trade Finance. iii. To discover which of the technological factors can best mediate the effect of the trust’s antecedents on customers’ intentions to use internet banking at East African Trade Finance. iv. To find out if Bank Support can influence corporate customers to adopt internet banking across East Africa. i. How does technology factors mediate the effects of trust on corporate customers’ intentions to use internet banking by East African Trade Finance? ii. Does perceived ease of use of internet affect customers' decisions at East African Trade Finance? iii. Which of the technological factors can best mediate the effect of the trust’s antecedents on customers’ intentions to use internet banking at East African Trade Finance? iv. Does Bank Support influence corporate customers to adopt internet banking across East Africa? i. Perceived Usefulness positively influences use of Trade Finance Internet Services in East Africa. ii. Perceived Ease of Use positively influences use of Trade Finance Internet Services in East Africa. iii. Organizational Support positively influences use of Trade Finance Internet Services in East Africa. iv. Bank Support positively influences use of Trade Finance Internet Services in East Africa. As a background of the study the researcher used mainly Technology Acceptance Model related research that in general examine user acceptance of online banking solutions. Although these studies cover wide variety of countries and aspects to the topic, most of them are related to retail banking. This research was about Trade Finance services offered to corporate customers in the Internet by one bank, within East Africa. Despite the case study nature of the research, the believe the results of this research were generalized to other Internet services designed for corporate customers, and especially for Trade Finance. Despite the fact that geographical limitations of this research narrowed down the amount of countries involved to four, generalization of the results can be done also in other so called African countries with society similar to the East Africa. The research data was collected, analyzed and presented over the course of six month period. The primary benefit of this study is as a contribution to knowledge in the areas of Internet banking adoption and factors that influence its adoption. The research will contributes to the limited number of empirical researches on internet banking. This research did an assesment on the current use of internet in banking sector in East Afica, hence try to provide some improvement recommendation on internet banking adoption there. This paper also highlight the potential power of internet banking as the main tool to promote rapid growth and expansion of banks with the simple and convenient facilities guided by internet. The study also provide great benefits for researchers, and educators though providing a clearer view and deep understanding for all the issues related to the field of Electronic Banking. The university and its authorized personel are permissible to use this paper for academic reference. The study will also act as a valuable resource for reference in literature review for those intending to do further research on e- banking related topics and finally, It will contribute value and input to the pull of the already existing knowledge by confirming theories that exist and making recommendation to the new facts. The study can also be a guide the e- banking institutions and other policy makers use to put strong policies that will help the entire economy if at all adoption of internet banking has challenges it is bringing to the economy as well as the customers and other stakeholders. This paper provide the Information System practitioners with more insight on strategic determinants of adoption of internet banking thereby making their work of conducting research, planning, developing and improving computer based information systems, software and related concepts, developing principles and operational methods as well as to maintaining information systems easier by ensuring integrity and security of data. Today there is an on-going debate and criticism of internet money transfer services, often originating from the banking industry. In many countries there is yet to be a clear statement whether or not the new services interferes with traditional banking, and if the same regulatory principles should be required for transfer services as for banking services. The heavy regulations of the banks have previously not been imposed on transaction based services. The data and analysis of this project is not only valuable for other countries that is in the making of implementing similar services (and many are), but also to regulators of the technology and any organization or company that wants to utilize a new infrastructure to distribute and transfer money. This could be local entrepreneurs, developers of the services or aid organizations to name a few examples. In order to design better financial services one must look at the needs and behavior of the users. In which direction are these services heading? If a new way of banking is formed that is evolving from transactions instead of savings, will it differ from what we have today? Much can be learnt from the successful implementations of these services in Scandinavia, also for services based in the developed world. The framework proposed that customers’ loyalty can be influenced by customers’ intentions to use internet banking. It also proposed that customers’ intentions to use internet banking can be affected by customers’ attitudes toward using internet banking. When customers have positive attitudes, they are more likely to adopt internet banking and vice versa. The framework hypothesized that customer’ attitudes toward internet banking can be affected by both perceived usefulness and ease of use. Customers’ perceived usefulness can be determined by perceived ease of use, customers’ self-efficacy, and customers’ trust, while their perceived ease of use can be affected by customers’ trust and customers’ self-efficacy to use internet in general and online banking in particular. The framework proposed that customers’ self-efficacy can be delivered by their technological experiences. Finally, it suggested that customers’ trust can be determined by shared value including security system and customers’ privacy, banks/customers communication, banks’ reputation in markets, Organization Support, Banks’ Support and customers experiences. All these factors will influence corporate acceptance of internet banking within East African Trade finance. In this chapter I present the research that has been done in the area of user acceptance of technology in the context of Internet banking, as well as adoption of Internet banking. First there is a brief overview of the field in general. After that I discuss about the relevant empirical studies done about Technology Acceptance Model and Internet banking, as well as other research about adoption of Internet banking. To complete the theoretical background, studies using Technology Acceptance Model with other information systems are included. As a summary of the reviewed literature, state of the art of the research this far is analysed. Finally I discuss the major findings relevant to this study, and research limitations necessary to take into consideration. User acceptance of technology has been studied repeatedly over the decades from various perspectives. The more important technology becomes as a part of our daily lives, the more companies expect their customers, suppliers and employees to be willing and able to utilize technology in various ways. It is understandable that at the same time research done in and around this subject has become more and more important. Several models describing and predicting the reasons for users accepting or rejecting a piece of technology have been created and evolved during the years. However, most of them are very much alike, and based on same pioneering findings made decades ago. Theory of Reasoned Action (TRA), Theory of Planned Behavior (TPB) and Technology Acceptance Model (TAM) are probably the most used theories for modelling user adoption of new technology. TRA and TPB are mostly used in the studies of social psychology to study the behaviour of people. Researchers of system usage and information technology adoption have also extensively adopted them. TRA is in fact the ancestor of both TPB and TAM. Technology Acceptance Model is an information systems theory, which is adapted from TRA. It is widely used for the purpose of predicting, explaining and enhancing common understanding of user acceptance of information technology in various areas. This research uses the findings based on TAM as the basis for the theoretical model: Also because TAM has been used in many similar studies earlier. Several extensions of TAM have been proposed and empirically validated also in studies conducted in the area of Internet banking – especially on the retail side of it. Overall, Internet banking, e-commerce and other information technology and information system adoption have been increasingly popular topics among researchers. This has been the trend over the last decade. In addition to Technology Acceptance Model, other theoretical approaches have been used to increase general understanding. As mentioned before, the theories remind very much each other. Regardless of the theory used, the researches support each other in terms of factors and determinants identified. Technology Acceptance model is introduced in more detail in the following sections in order to explain the foundation for this research. This figure is a description of the original TAM by Davis. The fundamental idea of the theory is that perceived usefulness and perceived ease of use influence the users’ intention to use information technology either directly or mediating via attitude towards the behaviour, leading to actual usage of the system. Attitude Towards (AT) and Behavioural Intention (BI) are common with the Theory of Reasoned Action. Perceived ease of use (PEOU) has a strong influence on AT through perceived usefulness, but also directly. Perceived Usefulness (PU) has a strong direct influence via both AT and BI. PU was defined as “the degree to which a person believes that using a particular system would enhance his or hers job performance”. “A system high in perceived usefulness, in turn, is one for which a user believes in the existence of a positive use-performance relationship”. PEOU was described as "the degree to which a person believes that using a particular system would be free from effort". (Davis, 1989). The original TAM was revised by leaving attitude from the model, as empirical validation proved that intention to use is only partly mediated by attitude (Davis and Venkatesh. 1996a). This figure is a description of the revised TAM by Davis and Venkatesh. Although TAM has been found to be very good in explaining user acceptance of technology, it has been further developed. In 2000, Davis and Venkatesh extended the theory and created TAM2. “TAM2 incorporates additional theoretical constructs spanning social influence processes (subjective norm, voluntariness, and image) and cognitive instrumental processes (job relevance, output quality, result demonstrability, and perceived ease of use).” (Davis et al, 1989). Furthermore Venkatesh et al. (1996) created a unified model called Unified Theory of Acceptance and Use of Technology (UTAUT). They compared eight models, developed and empirically validated UTAUT, which proved to outperform all the existing models from the past. Szajna (1996) empirically tested TAM by measuring both self-reported and actual usage in pre- and post-implementation. She found the model to be successful in predicting both. Legris et al. (2003) critically reviewed TAM by using 22 articles from 1980 to 2001. The articles were empirical studies using TAM respecting its integrity. Only few studies used all of the original variables, mainly they left out AT, which is in coherence with the revised TAM. variables from human and social change processes, as well as innovation adoption model. TAM explains normally about 40 percent of the variance in intention to use and usage behaviour, which further supports the perception of TAM’s suitability in this type of research (Legris et al 2003, Pikkarainen et al. 2004). Quite a few researchers have applied TAM when studying acceptance of Internet banking. Liao et al. (2002) even made an invariance analysis concluding that TAM is a well suitable instrument for evaluating Internet banking acceptance, but also that the suitability is independent of the respondent characteristics such as gender, age and information technology competence. The current research done about Internet banking and Technology Acceptance Model are reviewed next, presenting the major findings of them and the empirical environment. Sudarraj et al. (2005) used deconstructed TAM to measure the importance of usefulness and ease of use in online and telephone banking. They successfully validated the model with Canadian university students. Karjaluoto et al. (2002) built a model based on TRA and TAM, which was empirically tested with private Finnish retail bank customers. Their conclusion is, that “prior computer experience, prior technology experience, personal banking experience, reference group, and computer attitudes strongly affect attitude and behaviour towards online banking.” (Karjaluoto et al. 2002). Supporting findings were those of Lassar et al. (2005) who studied online banking adoption in the United States in the light of TAM. They concluded that the intensity of Internet usage is significantly influencing individuals’ adoption of Internet banking. These findings suggest that the more experienced the consumers are in using the computers and the Internet, the more likely it is that they will start using Internet banking. Another Finnish study investigated consumers’ acceptance of online banking: Pikkarainen et al. (2004) added perceived enjoyment, information on online banking, security and privacy and quality of Internet connection to the model. Surprisingly, they found only PU and information of online banking significantly affecting use of Internet banking services in Finland. Hong Kong students were used to empirically test another modification of TAM; in this study Chau and Lai (2004) also discovered that PU could be the only major factor directly influencing the attitude towards online banking. PEOU influenced also directly, but mainly via PU. Other measured factors like alliance services, personalization and task familiarity influenced through PU, and accessibility through PEOU. Suh and Han (2002) added trust to the original TAM model. They studied their model by empirically evaluating responses from personal customers of five major banks in South Korea and discovered trust to be a very significant determinant of user acceptance of Internet banking. Eriksson et al. (2004) made the same conclusion while studying the meaning of trust with Estonian private customers. Trust had a significant positive effect on both PEOU and PU, out of which PU appeared to be stronger in predicting the intention to use Internet banking. with Taiwanese consumers. Surprising results were found: perceived ease of use and perceived credibility were more significant than perceived usefulness in predicting the behavioural intention to use Internet banking. The surprising factor in this was, that majority of TAM related research has concluded that PU is the ruling factor over PEOU. Self-efficacy again was found to have significant effect through the three abovementioned factors. Factors familiar from TAM have been used in studies based on other theories and theoretical frameworks. The research methods and results resemble each other very much. Liao and Cheung (2002) empirically measured perceived usefulness and its attributes with retail customers in Singapore. They found out that “individual expectations regarding accuracy, security, transactions speed, user friendliness, user involvement, and convenience were the most important quality attributes in the perceived usefulness of Internet based e-retail banking”. Supporting some of the findings in Singapore, ease of use, Internet accessibility, awareness, trust and security concerns, convenience and attitude towards change were identified as main factors that affect the adoption of Internet bank services in Malaysia (Sohail and Shanmugham, 2003). Rotchanakitumnuai and Speece (2003) made a qualitative research among Thai corporate customers, which revealed that for corporations trust and security concerns were major barriers together with lack of organizational support (lack of IT resources, knowledge, management support, and training). Akinci et al. 2004 compared users and non-users in the process of trying to identify the factors influencing adoption among sophisticated consumer segments in Turkey. They stated that non-users were not aware of all the benefits of Internet banking and did not believe in receiving adequate help for problem solving when using Internet services. The non-users preferred traditional channels because of lacking in confidence in using Internet banking and worrying about making incorrect transactions, where as the users believed quite the opposite. These problems were identified already by Sathye (1999) in Australia almost 10 years ago: difficulty in use, resistance to change, lack of awareness, and benefits of Internet banking were standing out as the obstacles for beginning to use the online services. The research results suggest that the problem of difficulty to use could be addresses by banks giving better education to the customer. According to Sathye (1999), Customers also expect the banks to give comprehensive information on the benefits before adopting the service. Igbaria and Iivari (1995) extended Technology Acceptance Model in research about the effect of self-efficacy on computer usage in Finnish companies. Their TAM incorporates self-efficacy and the determinants of it (experience and organizational support) as the factors having an impact on computer anxiety, perceived ease of use and perceived usefulness and finally the actual use of computer technology. Self efficacy, computer experience and organizational support were proven to have significant direct effect on perceived ease of use. The results imply that “perceived ease of use plays very important role in mediating the relationships between experience, anxiety and self-efficacy and perceived usefulness.” Furthermore, “self efficacy, computer anxiety, perceived ease of use and usefulness partially mediate the effect of experience and organizational support on self-reported usage behaviour” (Igbaria and Iivari, 1995). In line with the findings of the studies in Internet banking, Igbaria and Iivari, also stated that perceived usefulness had the biggest direct effect on actual system usage. Davis and Venkatesh (1996b) then again modelled the antecedents of perceived ease of use, concluding that one of the most important variables influencing perceived ease of use was self-efficacy. Deriving from Iivari and others, McFarland and Hamilton (2004) studied computer anxiety, system quality, prior experience, others’ use, organizational support and task structure and their influence on computer-efficacy, perceived usefulness, and perceived ease of use and system usage. They discovered that system usage is significantly influenced by all of the abovementioned factors. They empirically tested the model with answers from users in US companies. Yi and Hwang (2003) again studied self-efficacy, enjoyment, and learning goal orientation also in the context of TAM with university students. They used web-based class management system as the piece of technology examined. Self-efficacy appeared to directly influence the use, whereas enjoyment and learning goal orientation mediated through self-efficacy, usefulness and ease of use. Usefulness and ease of use in turn influenced the decision to use through behavioural intention. examined four different e-commerce activities (shopping, banking, investing and online services) and their diffusion in the United States. The outcome was that selfefficacy, amount of internet use, perceived convenience, perceived economic advantage, and overall adoption of similar innovation positively have positive influence to the overall adoption of e-commerce. According to them, perceived risk has a negative impact, and therefore it works as a barrier to adoption of any kind of ecommerce. Jiang et al. (2000) utilized TAM in their empirical study about user behaviour and ecommerce. Their model had five constructs: utilization of the Internet, near term consequences, facilitating conditions and experience with the Internet. They found out that the most important driving factor influencing the utilization of the Internet is prior experience. Another significant positive relationship was found between facilitating conditions and utilization of the Internet. This implies that the more familiar the users are with the Internet, and the better they feel they can get information from the sites, the more likely they are to use the Internet service in question. As already mentioned before, Technology Acceptance Model is widely and successfully used in the research about adoption of Internet banking. The model has been criticized for being almost too easy to generalize to any piece of information technology. However, it can also be the strength of it, as it is fairly easy to extend the model with other theories and models. This can be seen from the amount of research in the Internet banking area. The resemblance of studies not utilizing TAM and those that are, can be easily seen. Same factors, variables and determinants are empirically tested with slightly different sample and method. The validity and reliability of the studies is good, although many of the studies are using university students as the sample. The use of such homogenized data can lead to results that are not applicable to the entire population of the respective country, for example. On the other hand the variety of countries and continents studied is satisfying for generalizing the research outcomes, also keeping in mind that the results are similar also in those studies that are using data with more invariance. Europe, North America, Asia, Australia, and Baltic countries, developing and developed countries have been covered with results supporting each other. Thus, the research items can be used to support the building of the model for Trade Finance banking in Scandinavian countries. particular system would be free from effort". - Previous Experience Prior experience with similar technology. From the vendor, in this case a bank. The reviewed literature works as a good basis in developing a model to measure the factors that influence East African corporate customers and their decision on whether or not to use the bank’s Internet services. The following chapter introduces the model, which includes presenting the chosen factors and their occurrence in the previous literature, as well as construction of the hypotheses to be tested in order to validate the model. This chapter provides a detailed description of the research methods that was used in the study in order to accomplish the research objectives. It gives the plan, structure and strategies that were used to prove the research hypotheses. The chapter covers the research design, research population, sampling procedure, research instruments, research procedure, Data analysis, Ethical considerations and limitations of the study. This study adopted basically correlation and survey research design. This study led to establish the factors that influence corporate customers to adopt online banking. The researcher was interested in this study due to constant inconveniencies that the corporate customers get when they need to transact banking business at odd hours when the banks are closed, it also enables the organization to run smoothly and deliver to the society. The clients’ data will be safe and will not risk losing their money and will boost the clients’ confidence in the company and the company will grow. The researcher collected data from business process in the organization, Corporate Customers, Current system if any,. The researcher used questionnaires and observation guide to collect the data, which he processed through dating, coding and classification. The researcher targeted population was business process in the organization, corporate Customers, Current system if any, Capability of the organization’s technology infrastructure and the management of the organization. The study involved a total of 472 customers from Kenya, Uganda, Tanzania and Rwanda. Quantitative analysis was chosen to test the research model, as it is good for measuring how many and in what proportion. In addition, with statistically reliable quantitative research it is possible to generalize the results: if the same questions are asked from different people with the same characteristics, the answers should support the outcome of the study. The method for collecting empirical data for the statistical analysis was customer survey. Questionnaires were sent out to randomly selected Trade Finance customers of the case bank; (Kenya Commercial Bank) in Kenya, Uganda, Rwanda and Tanzania. The questionnaires were developed together with this banks best Trade Finance specialists. With the help of the expertise of these specialists, the questionnaire content and validity of the questions were confirmed to facilitate achieving the goal of the study in the best possible way. In addition the questionnaires contained questions outside of this research, mainly related to customer service and open-ended comments. The responses to those questions are used for further analysis only for the case bank’s purposes. The questionnaire was divided into 3 parts: Part 1 handled demographics and data related to user background and usage of the system in general. In part 2 the Likert 5 scale closed end questions were included for testing the hypothesis. Part 3 contained open questions for the customers to express their thoughts with free text. The questionnaire was translated from English (appendix A) to Kiswahili language which is dominant within East Africa region. Informative cover letters written in Kiswahili was also included in the mails with pre-paid return envelopes. Some copies of the questionnaires were sent to all customers by mail at the beginning of November in 2009. The responses were then received by mail during the following 3-4 weeks in late December and beginning of January 2010. Before going to the field the researcher obtained an introduction letter from office of the Director of School of Post Graduate. This introduced the researcher as a student attempting to carry out an academic research. The researcher visited libraries and searched for data related to the study. The data collected was then sorted and categorized after which it was analyzed. The conclusions and recommendations then made. The survey questions and their relation to the hypotheses are presented in the table below. The study was primarily engaged in all sorts of target corporate customers who where viewed necessary for data collection and some selected key informants. Accordingly during the course of the study, the researcher provided personal or commercially valuable information about himself to the respondents. Then before an individual become a respondent of the study, he/she was notified of the aims, methods, anticipated benefits and the hazards of this study. Secondly it was a respondent’s right to abstain from participation in this study and his/her right to terminate at any time. The confidential nature of their replies was promised and no pressure or inducement of any kind was applied to encourage an individual to become a respondent of the study. The analysis was done with a system designed for statistical analyses (SPSS). Descriptive statistics and regression analysis, completed with Pearson product-moment correlation analysis, were selected as the methods for interpreting and analysing the empirical data. With the help of these statistical measures, the validity of the theoretical model and hypothesis are tested.